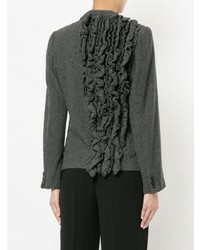 If you're looking for a casual yet stylish outfit, wear a Comme Des Garçons Vintage ruffle back detail blazer from farfetch.com and charcoal dress pants. Both garments are totally comfy and will look fabulous paired together. A pair of white canvas low top sneakers will be a stylish addition to your look. If you're searching for a casual yet stylish getup, try teaming a charcoal blazer with a black sequin mini skirt. Both garments are totally comfy and will look fabulous together. For something more on the daring side to round off this outfit, make pink fur flat sandals your footwear choice. Consider pairing a Comme Des Garçons Vintage ruffle back detail blazer with blue ripped boyfriend jeans to be both killer and relaxed. Wearing a pair of silver leather oxford shoes is an easy way to add some flair to your look. If you're on a mission for a casual yet totally stylish look, consider wearing a Comme Des Garçons Vintage ruffle back detail blazer and black leather skinny jeans. Both items are totally comfy and will look fabulous together. Amp up the cool of your ensemble by wearing black leather ankle boots. If you're after a casual yet chic ensemble, try pairing a Comme Des Garçons Vintage ruffle back detail blazer with blue denim shorts. Both items are totally comfy and will look fabulous together. Take your outfit into a more casual direction with black leather ballerina shoes. If you're a fan of functionality dressing when it comes to your personal style, you'll love this extra cute pairing of a charcoal blazer and dark green leggings. When it comes to footwear, this ensemble is finished off nicely with black studded leather lace-up flat boots. If you're scouting for a casual yet totally stylish ensemble, rock a Comme Des Garçons Vintage ruffle back detail blazer with a burgundy casual dress. Both garments are totally comfy and will look fabulous together. When it comes to shoes, this look is round off really well with black leather ballerina shoes. 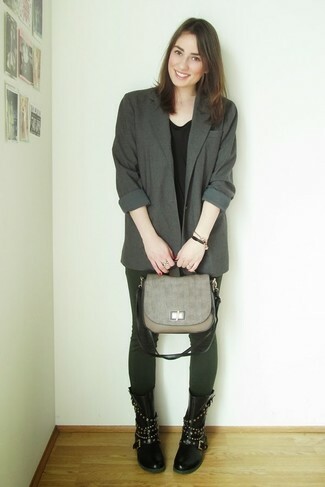 A charcoal blazer and black leather leggings is a nice combo to add to your casual repertoire. Rock a pair of black leather pumps to take things up a notch. 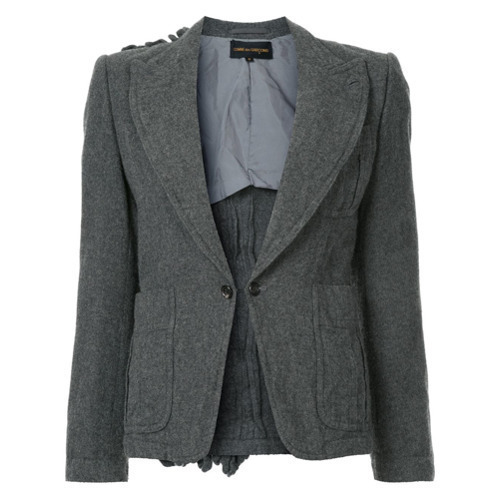 If you're hunting for a casual yet chic look, choose a charcoal blazer and burgundy print jeans. Both garments are totally comfy and will look fabulous together. For a more relaxed take, grab a pair of beige leather ballerina shoes.